Since RadDocumentPane is a direct inheritor of RadPane, it shares the same code base as its parent - the RadPane class. There aren't any functional or visual differences between the RadDocumentPane and the RadPane. 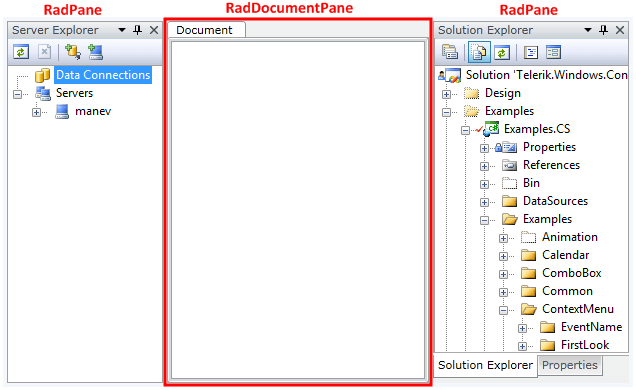 The RadDocumentPane exists to simplify the distinguishing between document panes and tool panes for the developer. To learn more about RadDocumentPane take a look at the RadPane's Overview topic, since all of the characteristics and functionalities of the RadPane are also valid for the RadDocumentPane. Use RadDocumentPane to host any kind of documents that are editable by your application, while the utility panels can be hosted in the standard RadPane control.